^ 中央人民政府和西藏地方政府关于和平解放西藏办法的协议. 中国政协新闻网. 人民网. 2011年5月20日 [2015-02-21]. （原始内容存档于2013-04-06）. ^ 4.0 4.1 4.2 4.3 Tsering Shakya. The Dragon in the Land of Snows: A History of Modern Tibet Since 1947. Columbia University Press. 1999. ISBN 978-0-231-11814-9 （英语）. ^ Qiang Zhai. The Dragon, the Lion & the Eagle: Chinese-British-American Relations, 1949-1958. Kent State University Press. 1994: 59–61. ISBN 978-0-87338-490-2 （英语）. ^ A. Tom Grunfeld. The Making of Modern Tibet. M.E. Sharpe. 30 July 1996: 109–110. ISBN 978-0-7656-3455-9. ^ 關於十七條協議. 藏人行政中央. 2014年8月19日 [2017-10-22]. （原始内容存档于2017-10-23）. ^ 钟辰芳. 海外藏人对甫辞世阿沛·阿旺晋美评价不一. 美国之音. 2009-12-24 [2009-12-26]. （原始内容存档于2009-12-29）. ^ 黄明信. 《追忆十七条协议翻译工作二三事》. 《中国西藏》. 1991年, (秋季号): 12–14. ^ Tsering Shakya. 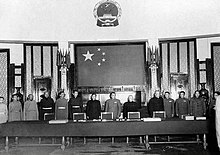 Chapter 33 The Genesis of the Sino-Tibetan Agreement of 1951. (编) Gray Tuttle; Kurtis R. Schaeffer. The Tibetan History Reader. Columbia University Press. 2013-04-02: 630. ISBN 978-0-231-14469-8. ^ 《历史的缩影和结论》档案陈列室展品清单. 西藏自治区档案馆. [2012-12-13]. （原始内容存档于2012-04-11）. ^ Jampa Tenzin. The 17-Point Agreement – An inquiry into the Dalai Lama’s return to Lhasa from Tibet-India border in 1951. Tibet Policy Institute. 注解10. 2014-04-28 [2015-04-06]. （原始内容存档于2015-04-12）. ^ 王小彬（中国藏学研究中心当代研究所）. 关于“十七条协议”“附件”之研究——为西藏和平解放60周年而作. 《中国边疆史地研究》. 2011年, (第2期). （原始内容存档于2015-04-13）. ^ 中央政府解決西藏問題十七條協議是如何簽訂的？. 新華社. 2008年4月20日 [2015-04-06]. （原始内容存档于2015-09-24）. ^ 第一章第五节 附加的秘密‘协议’. 《中共對藏政策與策略》 (PDF). 藏人行政中央. 2002年9月: 9,11頁. （原始内容 (PDF)存档于2015年4月15日）. ^ 黃昆輝批馬：和平協議恐成投降協議. 自由時報. 2011年10月18日 [2015-02-23]. （原始内容存档于2014-10-20）. ^ 歷史檔案：西藏五十年. BBC. 2001-05-23 [2015-02-15]. （原始内容存档于2016-02-06）. Facts about the 17-Point ‘Agreement’ Between Tibet and China (PDF). 藏人行政中央. 2011-05-22. （英文）這本小冊子的部分文章譯成中文，包括 藏中有關人員之著作或回憶錄所展示歷史事實. ， 宋黎明. 重評＜十七條協議＞. 2014年8月19日.